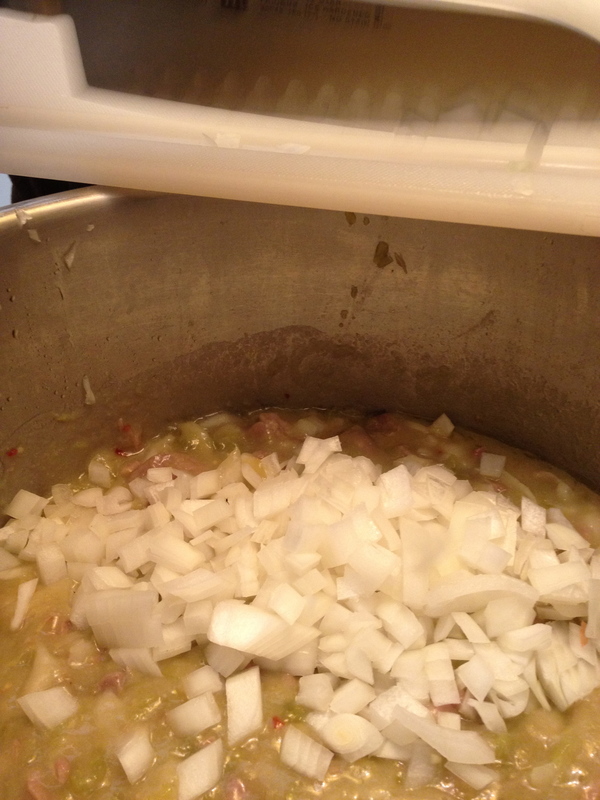 Dad’s chile verde — even better the next day for breakfast. Despite being descendents of mostly Eastern European stock, my parents introduced my sister and me to Mexican food at a fairly early age, which likely had to do with my dad’s early adult years. After leaving Wyoming, Dad lived in San Diego where he went to school. Later, when he got a job with Levi Strauss, and he and my mother bought a little bungalow in San Jose, next to a Mexican-American couple, John and Sarah Duarte. Or, as I knew them: Nina and Nino. I was born around that time, and Nina and Nino were designated my honorary godparents. Though I don’t remember living in that little bungalow, I do remember the many trips that Nina and Nino made to Salt Lake City over the years to visit us. I remember those times for the warmth and joy they brought with them, but also for the food. At an early age, I was introduced to traditional dishes like posole, nopales and menudo, none of which really appealed to my young palate. 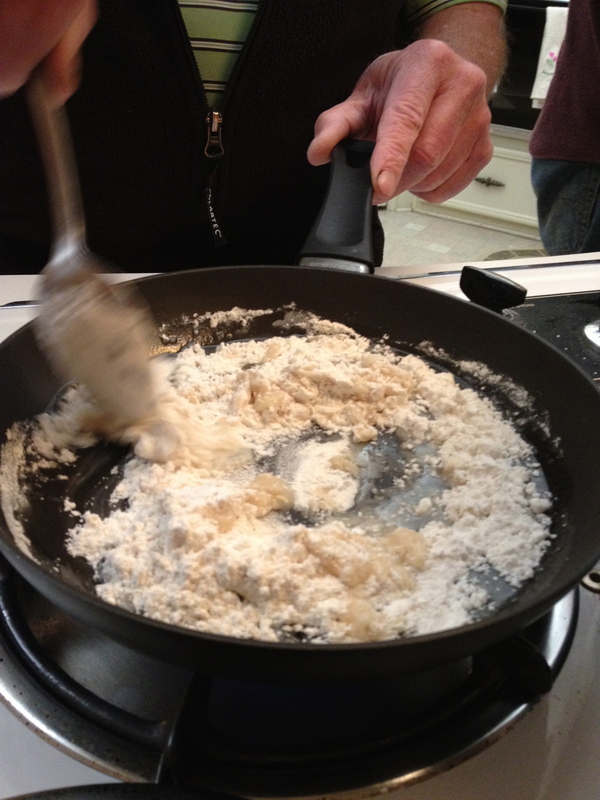 Of course with all of that also came the delicious thick homemade flour tortillas, hot off the griddle. I ate mountains of them as a kid. When my parents moved to Utah, I can only imagine they each sought something familiar to make it feel like home. For my dad, that search seemed to be rooted in food, and he always was looking to discover the little dives for the most authentic Mexican flavors he could find. I asked Dad about his chile verde recipe, and he told a story about working downtown and going to a cafe called La Paloma around the corner from his office on Exchange Place. He’d go in every morning around 7am to sip coffee, and talk to “Grandpa Joe” who was busy making the menu’s standards. While Grandpa Joe closely guarded his recipe for chile verde, Dad studied and made mental notes of the ingredients and proportions. 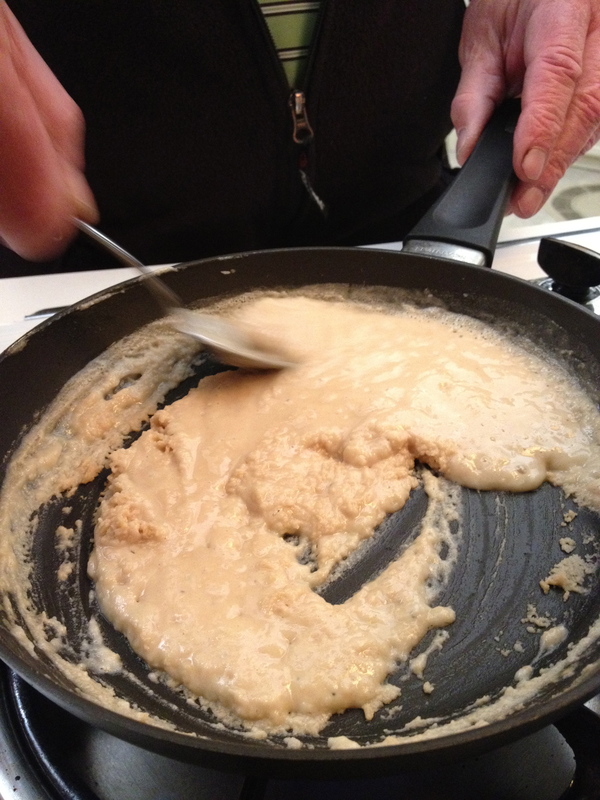 In fact, this is the way my dad has always cooked, and always will. I don’t think he’s ever followed a recipe in his life: For him it’s all about interpretation, experimentation and knowing what flavors work well together. 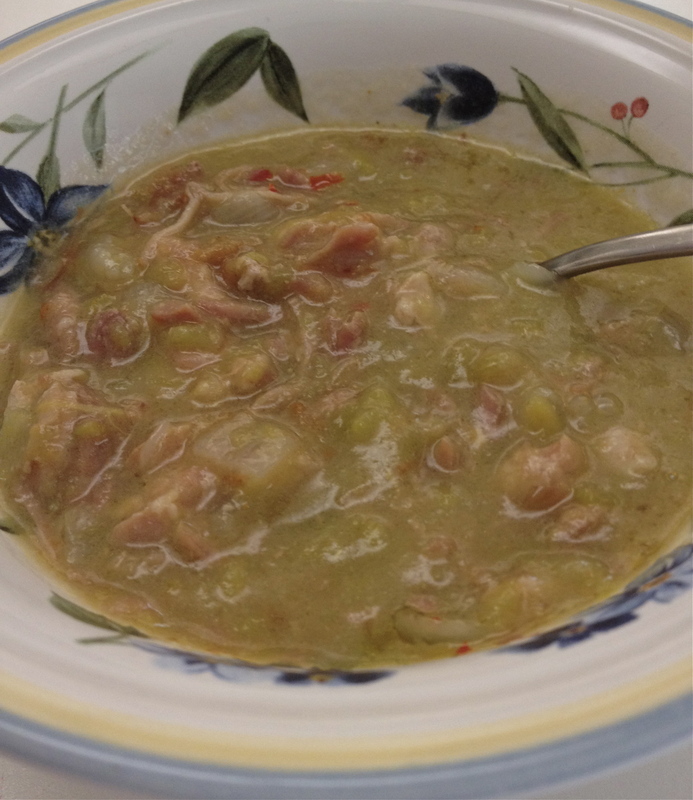 During our annual President’s Day trip to Borrego Springs, I asked Dad to make his version of chile verde, the one I remember from my childhood, the one served for so many years at La Paloma. It tastes the way I’ve always remembered it: simple enough that the flavors of the basic ingredients stand out. It’s also got a lovely glossy texture thanks to a generous helping of roux. Of course, it’s good over a bean burrito, but even better the next morning just in a bowl. And with a homemade tortilla, hot off the griddle, it’s a taste of heaven. 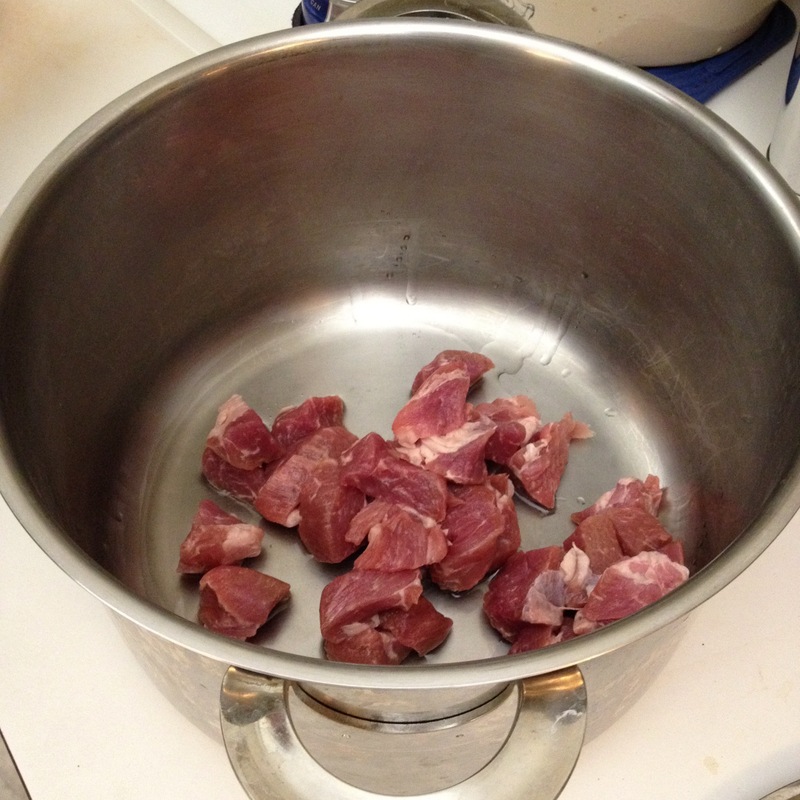 Pour a couple tablespoons of cooking oil into a Dutch oven or braising pan, add the pork pieces and season with salt. 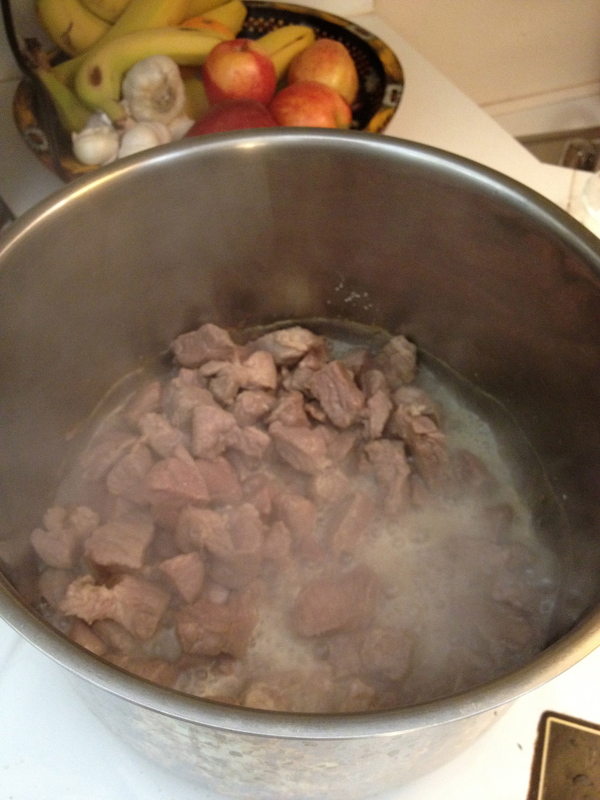 Place the pot over a medium flame and lightly brown the pork. (Don’t go overboard with the browning. Dad says it should remain “slightly rubbery looking.” Code for not-too-well browned.) Add the water, the canned chiles and the granulated garlic. Stir to mix and cover. Let simmer for about an hour. 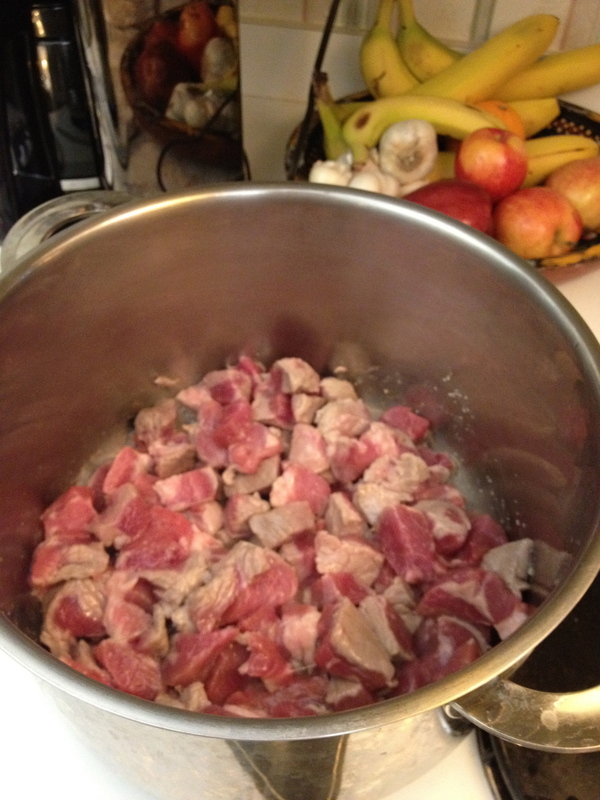 Cubed pork goes into pot. Browning the pork, just so. In go the chiles and water. See that nice golden color? That’s what you want. Mixing the roux with the simmered stew. A bit of onion right at the end for texture and flavor. simple, yet so wonderful. i can just hear those onions crunching with my first bite. I’ll have mine over eggs please. Mmm, over eggs would be good. Or … with a fried egg on top! Hi Gary — thank you so much for your nice comment. 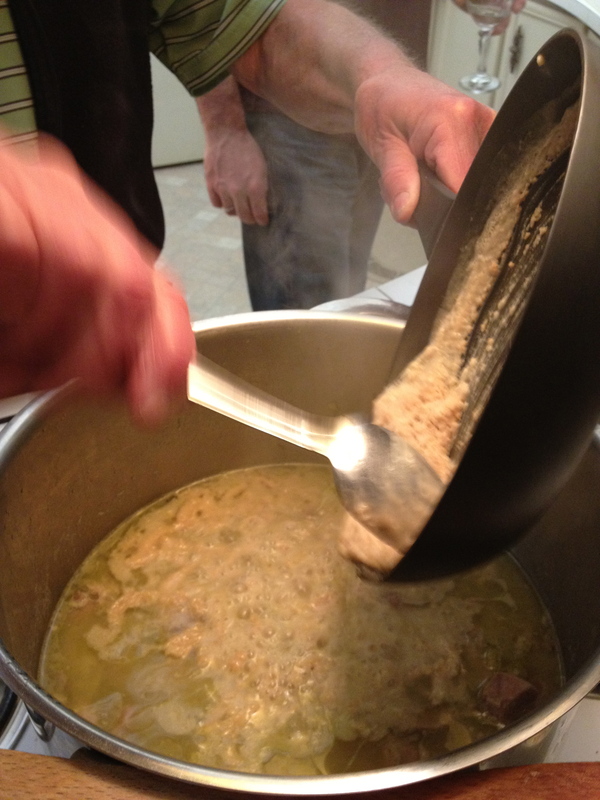 As you may be able to tell, we are a family that loves chile verde, and I am so glad that my dad was able to pick up this recipe from your family’s restaurant. I should be thanking you. Your great grandparents clearly were talented chefs. I don’t recall who Gary is, but I will say how happy I am to know that people have not forgotten the history & legacy that my grandmother & my mother left behind ,in the restaurant business. that I have known all of my life. I was a young child when I stayed with my grandmother Lillie, at the time she lived in rock springs, wyo. and owed & operated the then El, Monterey Mexican restaurant in the 50’s . Of course years later moving to Utah,she then opened up the La Paloma in salt lake on 4th so.then on to 2nd west , then on to rosé park where she took ill and had to retire. Handing it down to my mother Tommy who then opened up a 2nd one on Main Street and around the corner was the street Exchange Place. I remember on Main Street I worked there hostessing for my mom also in rosé park. But the most resent was when they all closed the doors on the La Paloma, then in honoring my grandmother Lillie my mother Tommy one last time reopened her Mexican restaurant in honor of her mother giving the name The El Monterey it’s original name. There were actually two people that went in on this venture, Tommy & her best friend Julie Brinkerhoff . All of these amazing woman are gone now. But will never be forgotten! And with the recipes & the know how that my grandmother & mother left behind well mostly the know how because there were no recipes lol they never wrote anything down. And I must say that both restaurants where always known for its trademark which was called the Original Burrito smothered made with chile verde of course! And also regretfully I have to say the the recipe in this chronicle being used as ‘ Dads chile verde’ is not accurate. Grandpa joe with all do respect was not the cook and did not know how it all went together he was not capable of that ,he & my grandma had that understanding. 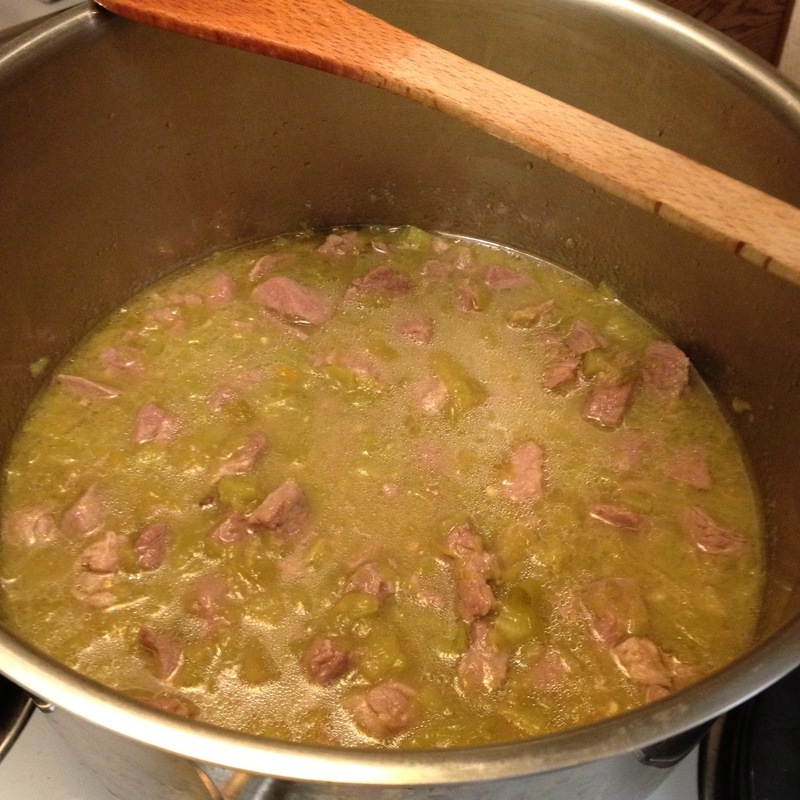 And not to say that this : Dads “chile verde” recipe is by any means is wrong its not! It’s just not ours. And I’m sure it’s wonderful enjoy!! And thank you all for remembering ‘Mama Lillie’ that’s what all her friends called her & her daughter Tommy. Sincerely, From the children & grandchildren of these two woman. Jeannie, thank you for your wonderful commentary and for setting the historical record straight. There is nothing I respect more than a family led by strong women. Thank you and your family for sharing their story. I should clarify, of course, that my dad’s version is his own, and only based on what he learned by watching and piecing things together while regularly enjoying the food at La Paloma. I don’t doubt that his version is very different from your grandmother’s. My dad puts his take on everything that he’s ever cooked. Whether or not he actually talked to the real Grandpa Joe, we may never know. That’s how he tells it, but who knows what actually happened. I come from a family of great cooks who also guarded their recipes and never wrote anything down. And I certainly respect that. 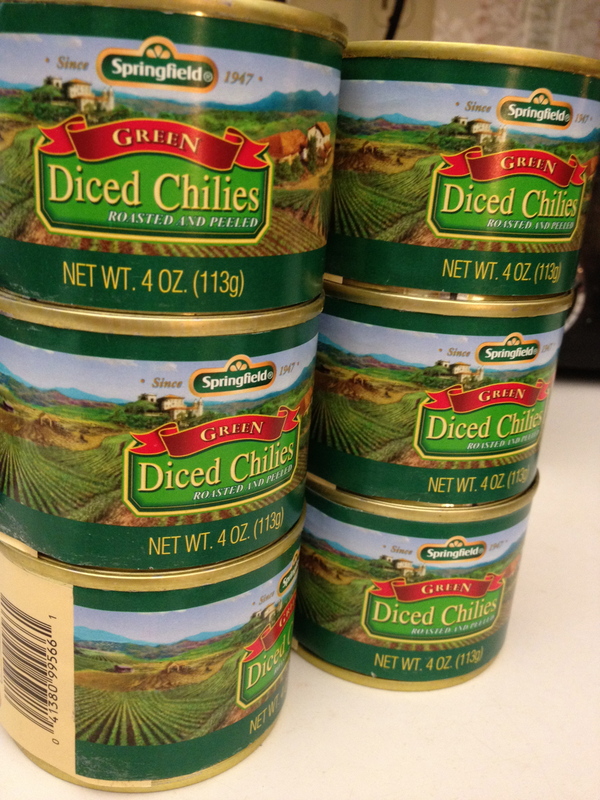 However, if you ever would like to share your version of chile verde with me, I’d love to try it out! Feel free to email me at chileverdechronicles@gmail.com. Thank you again for the comment. I enjoyed reading it, and who knows – maybe someday we’ll have a La Paloma family reunion right here!